Thanks to the work of American photographer Edward Ranney beginning in the mid-1970s, and culminating in the ongoing efforts of Chambi’s descendants to establish a permanent archive to preserve and promote their forebear’s artistic legacy, Martin Chambi is poised to achieve much wider and lasting recognition as one of the preeminent photographers of Latin America, one whose profound and telling images rank with the finest work by any artist in world photography. “I think the greatness of Martin’s photographic work is found in the warmth of his photographs, the way he framed his images, his artistic motivations, and especially his use of light and its evocative power to communicate with ‘his’ people,” says Chambi’s grandson, Teo Allain Chambi, director of the family run Archivo Fotografico Martin Chambi, who was interviewed via email from his home in Cuzco, where Martin operated a commercial photography studio for many decades and established his national reputation. According to Teo, there are an estimated 30,000 glass-plate negatives in Martin’s archive in sizes ranging from 10×15 to 13×18 to 18×24 centimeters, all still housed in their original boxes. Of that total, approximately 6,000 have been scanned to date. Teo launched the Archivo Fotografico in 2005, and has consulted with American photographers, curators and museum experts at such institutions as the Getty Museum, the George Eastman House, the International Center of Photography and MoMA for recommendations on collating and preparing the archive for preservation, academic study and exhibition. The primary goals of the project have been to electronically archive all of Martin’s negatives, restore existing vintage prints for museum exhibitions, open up the collection to scholars and researchers, and purchase the building in central Cuzco that held Martin’s original studio with the hope of restoring the structure to house the archive, a museum and gallery, classrooms for a photography school, cataloguing rooms, and research and residence facilities for visiting scholars and academicians. “By preserving and making available the images of Martin Chambi and allowing public access for further understanding of his oeuvre, we hope to create broader opportunities to enhance the educational and preservation interests of a range of Peruvian artistic photographers and Andean culture and history,” explains Teo. To raise funds for the project, the Archivo Fotografico is offering new prints from the original negatives for sale, all signed, numbered and accompanied with a certificate of authenticity. No vintage images are for sale. Additionally, a limited-edition fund-raising portfolio from original Chambi 4×5 glass plate negatives (first produced in 2005 and featuring accompanying text by Brazilian film director Walter Salles) is still available and currently priced at $3,500 USD. The “Martín Chambi Photographic Archives Limited Edition Portfolio” features five 11×14 gold-toned, bleach-bath, silver-gelatin prints; two representing iconic Chambi images and three never-before-seen images, significant to Chambi’s life work. Born in 1891 in the southeastern city of Puno on the shore of Lake Titicaca, and raised in a Quechua-speaking peasant family, Martin Chambi was most widely known for his commercial portrait work and scenic views taken in and around the Andean countryside near the ancient Inca capital of Cuzco. His Andean landscapes, archaeological studies and ethnographic images were especially popular with tourists, who bought numerous images of his work in the form of postcards, a format Chambi pioneered as a way to sell his work at an affordable price. Upon deciding to pursue a career in photography, Chambi moved to the city of Arequipa in 1908, where he apprenticed at the studio of well-known commercial photographer Max T. Vargas. By 1917 Chambi began working independently, living and establishing his first successful studio in Sicuani. 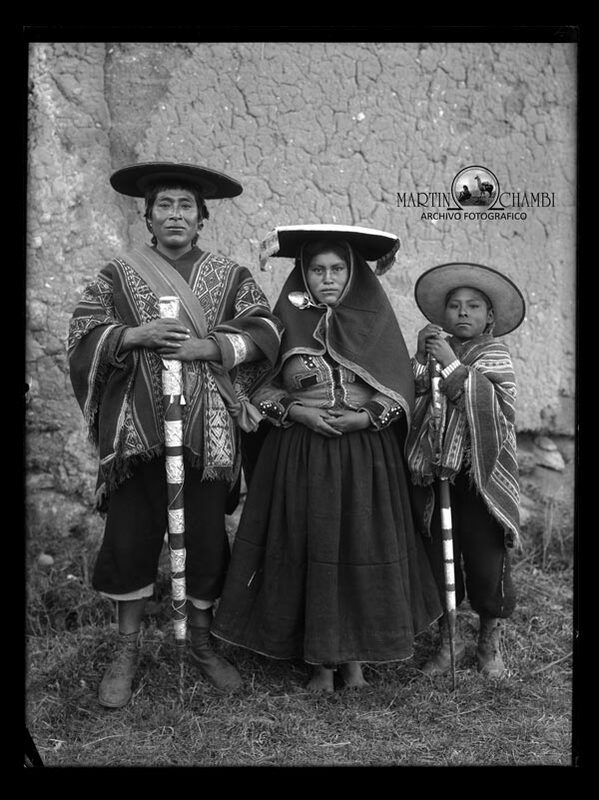 Around 1920 he settled in Cuzco and became much in demand as a society and portrait photographer for that city’s more affluent classes. Using Cuzco as a base, Chambi photographed extensively throughout the southern Andes, recording landscapes, Inca ruins and the lives of the indigenous peoples of the Andean region. Chambi’s photographic style and technique drew heavily from both European and the Pictorialist styles of his era, and his work soon drew recognition and prominence in local art salons and competitions. What was groundbreaking about Chambi’s work was the empathy and insight with which he photographed his documentary subjects. As a Quechua speaker, Chambi established a rapport with his subjects unavailable to cultural outsiders. His work conveyed an insight and authenticity unique to similar work from that period. His affinity for native culture led to his becoming a participant in the blossoming “indigenista” movement in Cuzco that affirmed and emphasized the rich and vital traditions of indigenous culture that sought expression and validation in the complex and growing tension between tradition and modernity that characterized Peruvian society in the first decades of the 20th century. Addressing the significance of this movement in 1936 in connection with a series of exhibitions of his work in Chile, Chambi noted the deep connection that existed between his own art and life and the experiences of native Andeans. During his lifetime, Chambi held 10 exhibitions of his work, beginning in 1917 in Arequipa and including a major exhibition in Lima in 1935. To date, five monographs on Chambi’s work have been published. According to Teo, the Archivo is preparing to publish a comprehensive book of Martin’s Peruvian work to be released on the occasion of the proposed grand opening of the museum in 2015, which will feature never-before-seen images, vintage prints and correspondence by Martin. Much of Chambi’s worldwide reputation after his death in 1973 is attributable to the efforts of American photographer Edward Ranney, whose landmark publication Monuments of the Incas, first published in 1982, is regarded as one of the definitive works on Inca archaeology. It was during a series of visits to Cuzco in the 1960s and ’70s that Ranney (who was awarded a Fulbright Scholarship to begin work that would result in his large-format photographs of Inca ruins) became familiar with Chambi and his photograpahs. “My first encounter with Chambi’s work was through postcards that were for sale in Cuzco,” recalls Ranney, who was a key early supporter and consultant for the Chambi family and their efforts to create a permanent archive for Martin’s photographs. After that initial review of Chambi’s work, Ranney had 35 prints made by the Chambi family from selected 8×10 glass-plate negatives and brought them back to the U.S., where he met with a number of experts on Cuzco and Peruvian culture, including Yale University art historian George Kubler, who knew Chambi personally. After meeting with Earthwatch, a nonprofit based near Boston that sponsors cultural, scientific and archaeological expeditions, and which offered to fund an expedition to work on the Chambi archive, Ranney returned to Cuzco in 1977 to conduct biographical research and to print as many of the glass-plate negatives as possible. With the assistance of the University of New Mexico and a grant from the National Endowment for the Art’s museum program, Ranney presented a series of major exhibitions of Chambi’s work for the first time outside of Peru. Beginning in 1979, Chambi’s images were exhibited at the University of New Mexico Art Museum; The Photographer’s Gallery, London; and the Museum of Modern Art, NYC. In the early 1980s, Chambi’s work was also included in a major group show of Latin American photography at the Kunsthaus in Zurich, Switzerland, that awakened broader international appreciation of the artistic, cultural and historical significance of Chambi’s oeuvre. What stands out about Chambi and his work in Ranney’s estimation is less the beauty of individual images or the obvious ethnographic interest in a supposedly lost, ancient culture, than the insight and depth of his focus on a singular and vital cultural and social milieu. “The big surprise frankly in examining his archive is not in the documentary work but in the extensive, overall portrait of Cuzco as a society,” states Ranney. “As a working commercial photographer active from the early 1920s to the 1950s, Chambi photographed a mix of classes, families and social situations, creating a real history of Cuzco. He documented the process of a people in the various stages of acculturation, being Indian and mestizo and becoming members of Cuzco society. It is surprising how incisive and penetrating his view of people and their backgrounds is in his pictures. It is this depth and authenticity that reflects the essence of Chambi’s artistic achievement, according to Seattle-based photographer, curator and museum consultant Adam L. Weintraub, who befriended Teo Allain Chambi in Cuzco while leading photography tours through the Andes. It was Weintraub who provided critical introductions, guidance and technical assistance to Teo during his initial efforts to establish the Archivo back in 2005. For additional information or to purchase prints, please visit martinchambi.org. Our thanks to Teo Allain Chambi and the Archivo Fotografico Martin Chambi.